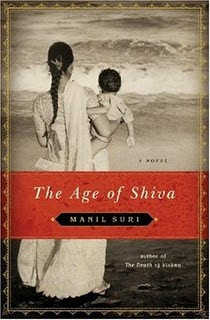 The Age of Shiva follows the life of Meera through her marriage to Dev, a talented musician struggling to make a living, and through the various divergences in her destiny as she aimlessly plods though her disappointments, clinging to her son as the only reason for her existence, till she finds her foothold and purpose in life. The story unfolds right after the partition between India and Pakistan, when the tension between Hindus and Muslims heightened and gave birth to the Hindu fundamentalists, and later flows into Indira Gandhi’s reign, and the years of Emergency. The political background gives some perspective to the story, the characters, and some of their decisions. Just as how Parvati molded a son out of turmeric and breathed life into him, creating her own personal attendant and friend, in effect, that’s how Meera views her son. The events leading up to the inevitable separation from him, is her Age of Shiva. There are so many levels to this story and the characters that I don’t know how to summarize it... maybe I shouldn’t be trying to, for it takes away the book’s intensity. Cutting through all the layers, it is a common enough story of a woman caught in the various trappings of society and traditional norms. But it’s the power of the words crafting the story that makes all the difference. I was mesmerized by Suri’s writing. It is delicately sensitive, incisively insightful and clear, and rivetingly poetic. It is absolutely beautiful that I have been craving to read more of his words, randomly turning to pages and not caring about the context or the story. It’s been ages since I did something similar, hopelessly hypnotized by the writing. Ok, I will stop gushing now. Be forewarned though, that if you don’t have a poetic streak/love/inclination, you will find the writing laborious and tedious. But to me, his writing is what pulled together a regular story of a mundane life into a gorgeous and poignant work of fiction. The protagonist, Meera, is hard to sympathize with at times, yet (I will harp again), the writing made her shine in a light of vulnerability that made me reach out to her. Her emotions, feelings and thoughts were so palpable that I wrapped myself in them and felt miserable for her. Despite hardly any correspondences between our lives, I somehow could relate to and understand Meera, in spite of my frustrations with her. And although there is no intense suspense or drastic turn of events, I was hooked to the book, eager to know more about a woman who kept blundering through her life. And I love the book just for this quality! Well, I might be painting the image of a deluded romantic in love with the writing and gushing about a boring story. Not true (well, not entirely)! Suri manages to bring to the fore those subtle aspects of our lives which are riddled with constraints and disappointments, and presents the basis for all the underlying resentments and misery. He shows how much we are variables, dependent on factors such as the society we are in and the families we are bound to, and that our individual destinies get shaped by the push and pull of these forces. In essence, every little step influenced by our surrounding is what results in drastic shifts in our life …. and unfortunately, there is very little that can be done to break-free. Wherever we go, the patterns repeat. The ability to break-free, in its true sense, rises from a deeper place from within us. It is the ability to break free from our vulnerabilities and still live within a prejudiced social structure. We realize the value of such independence only after suffering the loss of dependency. In addition, the characters in the story are well framed. Suri’s exploration of the various relationship dynamics - between husband and wife, father and daughter, siblings, sister-in-law and brother-in-law, sisters-in-law, and most importantly, between mother and child, is very interesting and quite realistic. It is interesting because of the hidden depths to which his exploration seeps. Suri delves into an especially uncomfortable zone, the intimacy between a mother and son, and the possibility of a latent sexuality underneath it. Although I found it extremely repulsive and reproachable to even read, after much thought, I think it makes psychological sense for Suri to have introduced this issue in this story. Suri has done a beautiful job of expressing a mother’s intensity of love and her fiery instincts of possessiveness. I was teary-eyed throughout the book although I’m not a mother to empathize with the instincts... but I felt I could read my own mother and feel her pain, however irrational it may sound. Viewed from such a psychological point of view, and taking into account the various circumstances through which Meera and her son go through, it is understandable that the issue of Oedipal complex surfaced. But not to cringe, Suri barely scratches the surface... but even the tip of the iceberg looks menacingly huge sometimes. And I saw many more intricate facets to the discussion than just lust, although it takes time to get to that point of reflection. I have floundered enough with this post because I can't verbalize that which managed to impress me. I may have made the book seem disturbing (even disgusting) and full of despair, but I am not able to convey the feeling of poignancy that erases all of that and simply just moves you and lets you connect with the simple human emotions and needs pulsing through the story. I see this book eliciting only one of two reactions from its readers - love or hate, nothing in between. Neeraja! You're devouring books! Awesome! You know, I usually like to know very little about books I read. You're giving away quite a bit- I realized when I read your review of Eat Pray Love. :-) I searched your blog to see if you'd read it after I read/reviewed it, as I was curious whether you'd read it and to see what you thought... I haven't read your other reviews but will read them if I've read the same book, so we can discuss. Sumi, nice to hear from you! Well, although everyone sees my posts on books as reviews, I really don't write reviews. I started this exercise of putting down my thoughts/feelings on what I read to glean more understanding and insight on the themes and discussions in the book... and it's oddly helped me understand and remember the book better! But I guess to the readers, it's a jumble! I usually am cautious to not reveal spoilers or the entire plot/story, but sometimes I get carried away as I start dissecting! Sorry about that. I have stayed away from rating because I didn't see myself as a reviewer and was hung up on what metrics to use! But will think about it and include it in subsequent posts..
And would love to discuss books you've read!